Photo measuring 10 x 8 inches. Since everybody seemed to enjoy yesterday’s group photo, I thought I’d post another one, but one that is rather different. I’ve always been tickled by this photo, the neat rows of people crowded together, rigidly formal yet full of smiles, in a setting that is almost incongruously sunny and festive given their soberness. I always assumed this was something like a portrait of the staff of an insurance company, with the man front and center holding an insurance industry text. In fact, I think that’s how it was described when I bought it. But in preparing this post, I finally bothered to take a closer look, enlarging the image with my scanner and doing some internet searching. It turns out the book is The Desire of Ages, by Ellen G. White, and therefore, if we are to extrapolate from that single clue, this may be a gathering of Seventh-day Adventists. I have a friend who’s recently gotten involved with the Seventh Day Adventists. She’s darling and I wish I knew more about them. This doesn’t look like her kind of scene, though! 12 Jan 2012 at 11:30 am M.O. I, too, do not know much about the Adventists, except for the fact that they are vegetarian and go to church on Saturday. I recently read that in Loma Linda, CA, a town that used to be dominated by Adventists, a recent plan to build a McDonald’s within city limits caused an uproar. In the same article, it was mentioned that supermarkets within city limits do not sell meat. Another piece of trivia is that Prince was brought up as an Adventist. I think he is Jehovah’s Witness now. 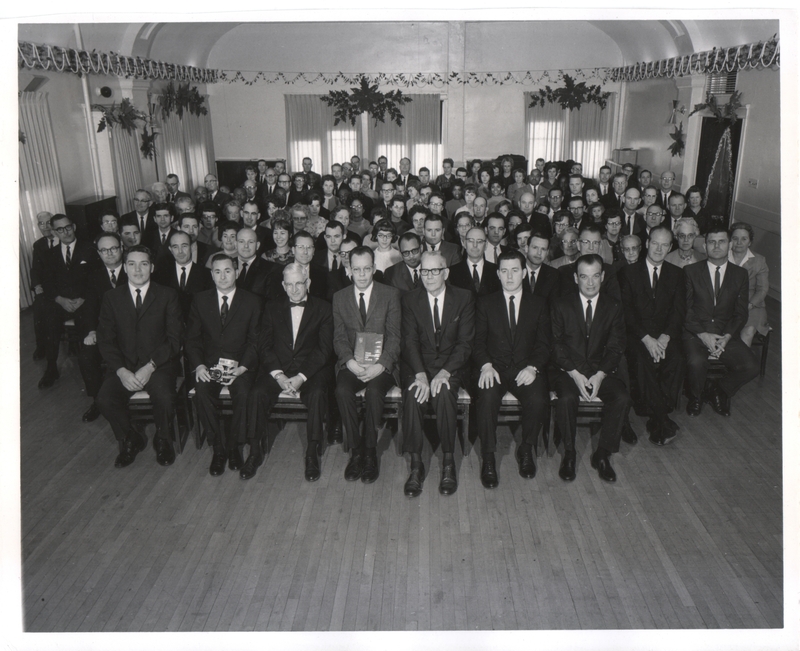 The man second from the left in the front row is also holding something – it looks significant but I cannot figure out what it is. Any ideas? Yes, I actually took a closer look at that, too. It’s a camera with a flash attachment. Of course, now that you tell me I can see that it is a camera. Funny how I could not make it out on my own. Thank you. You’re welcome. Don’t worry, you’re not alone. I could tell it was a camera, but I had to enlarge it to figure out what the flash attachment was. 12 Jan 2012 at 6:28 pm M.O. I just remembered that there was an Adventist bookstore across the street from Bryant Park and the NY Public Library. I was very curious about it, but it was closed at the time that I passed it. Thanks for posting this fascinating photo! I’m going to look for copies of the book on eBay! Not that I would ever try to stop anybody from buying a book, but just so you know, you can download it for free off the internet. Maranatha Romania Adventist Mission is a lay self-supporting adventist ministry. We are a group of young people and Christian Adventist brethren from Romania, from many areas of the country who want to serve God and people through our time, talents, money and everything we have. As an organization desiring to spread the Gospel, our aim is to work in harmony with the Bible, the writings of Ellen G. White, and the teachings of the Seventh-day Adventist Church. WordPress filtered this comment out as spam, but since it seemed somewhat on topic, I thought I would allow it.